1. Since PHP is a loosely typed and interpreted programming language, it does not have a same speed as that of compiled languages. So if speed and performance is your concern PHP might not be a good option. 2. For the enterprises that use Microsoft technology stack, using PHP as the programming language is difficult to work on especially if you wanted to access system level functionality. So platform integration could be the issue if you have to perform extensive integration with Windows OS. 3. With other languages and frameworks, like C# and Java, you can target Desktop, Mobile and Web using the same programming language. 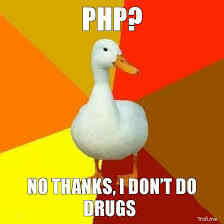 However, with PHP you are limited to web. 4. PHP has a reputation of being an insecure programming language and has long history of security issues. Having mentioned all the downsides about PHP, you can still find it being used in building enterprise applications, banking applications, and others but the use cases are very few compared to other programming languages.